The depth of a burn determines its severity. First degree burns damage the outer layer of skin (epidermis) and cause pain, redness and swelling (erythema). 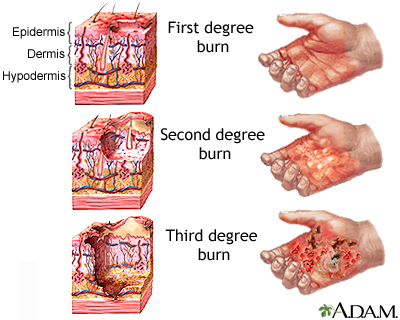 Second degree burns damage the epidermis and the inner layer, the dermis, causing erythema and blistering. Damage from third degree burns extend into the hypodermis, causing destruction of the full thickness of skin with its nerve supply (numbness). Third degree burns leave scars and may cause loss of function and/or sensation.